Our favorite wake up activity is checking out the sunrise on sunny days, which there are many of here in the western North Carolina Mountains. There are almost as many sunny days a year in the High Country of North Carolina as there are on the Low County of South Carolina and Georgia. Hard to believe but true. The sun combined with a large amount of rainfall that comes down in buckets (it rarely sprinkles) creates a temperate rainforest that allows all the rhododendron and laurels to flourish. We are loving sunny winter days as there were so few of them in Northeast Ohio where me moved from. Lake effect weather from Lake Erie makes winters dreary there, of course the temperate summers and warm colorful autumns are wonderful, but the winter is very longggggggggg. 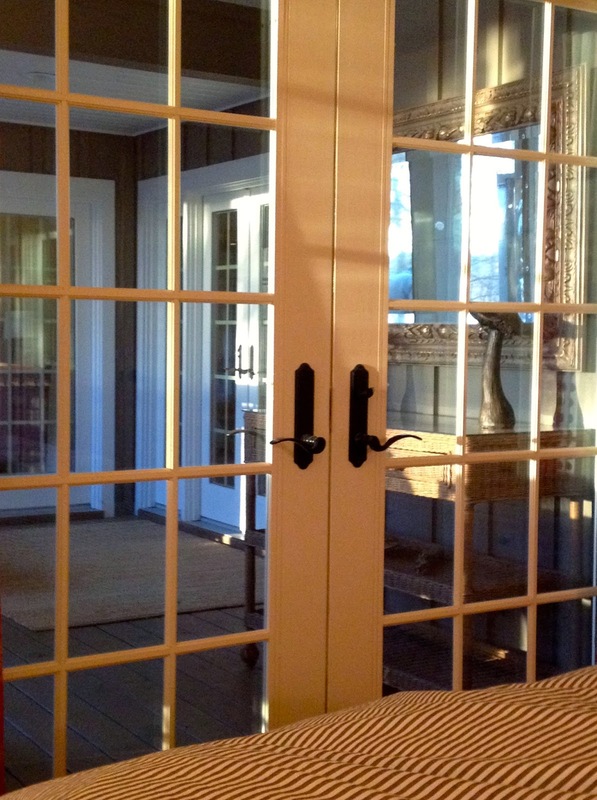 The mirror on the porch, seen though the French doors of our bedroom, reflects the mountain view and the sunrise as it appears over Whiteside Mountain. A few days ago we were greeted with this beautiful sky! Every sunrise is beautiful and it is interesting to see the sun's position as it moves through the seasons. Hope you are enjoying sunrises or sunsets in your neighborhood this winter! What incredible, long views you have at your house. Just beautiful. My bedroom faces east; so when there are sun rises to be seen, I enjoy them very much. Here in central Ohio, the winters aren't AS grey as they are up near the lake. Often the sun will rise, it will appear to be a sunny day, and then around 8:30 it will be obstructed by clouds. What I like least is the weather we've been having lately. It's like March. Mud, spitting rain, warm front/cold front. I loved last year with the consistently snowy December. Hope to see how you decorate for Christmas in this new house! Oh, such spectacular skies! Thank you for sharing them with us. Yes, our winters down south are very mild compared to other parts of the country. We'll have highs near 60 this Sunday! I hope we'll have a little snow this winter, though. It comes and then it goes, unlike where I grew up in New Jersey and upstate New York!